It is with great sadness that the family of the late Stephen John Probert announces his passing at the Health Sciences Center on December 2, 2016, at the age of 66 years. Predeceased by his parents John and Elizabeth Probert; sister Judie Smith; and special aunt Mary MacDonald. Leaving to mourn his loving wife of 42 years Maureen (nee Hammond); devoted children Gillian Duff (Peter), Andrea Chaulk (Michael), Jennifer Higdon (Jerry), Kathryn Probert (Ryan) and Gregory; his pride and joy grandchildren Bradley, Nicholas, Alicia, Lucas, Jacob and Savannah; special brother-in-law Gord Smith, and a large circle of family and friends. Special Thanks to the staff of the Emergency and ICU unit of the Health Sciences Center, and also Dr. Mercer, Dr. Hamilton and Kim Roberts-Pennell. Visiting at Carnell’s Funeral Home, 329 Freshwater Road, on Sunday, December 4 from 7-9 p.m. and Monday, December 5 from 2-4 and 7-9 p.m. Funeral service will be held at The Carnell Memorial Chapel on Tuesday, December 6 at 11:00 a.m. with interment to follow at Mount Pleasant Cemetery. In lieu of flowers, donations in Stephen’s memory can be made to the Arthritis Society of NL or the NL Lung Association. My sincerest condolences to the Probert family. Steve was a consummate professional, this quality and his unending kindness is a powerful legacy to leave behind, he will be missed. RIP Steve. I was very shocked and saddened to hear that Steve had passed away. When I would meet him in the halls at Service Canada he would always smile and say hello. And, for a short time, many years ago, we worked together in Financial Services. I’ll always remember Steve as a very kind man. Also, Maureen, you might remember that we both worked together for a brief time in Admin, many moons ago at Service Canada. My deepest condolences on your loss. May you find peace in the love of family and strength in the caring words of friends. Moe – I was surprised & deeply saddened to hear the news about Steve. Throughout our Friendship in our “Younger Years” on New Cove Road, Steve will be fondly remembered as easy going Guy & always had that great sense of humour to share. My sincere thoughts are with You & Your Family. Condolences to the Probert family on your loss. We’d not seen each other for many years (more’s the pity) but Stephen and I were good friends and classmates at St. Bon’s. Despite the years, I remember him well – and fondly. He was smart, funny and kind – traits that endeared him to many then and no doubt throughout his life. Like so many others, I will always remember and value Stephen’s friendship. Best wishes from Elaine and I to Maureen and family. Please accept my sincerest condolences. Steve was a great colleague and friend who I had the pleasure of working with for many years. He could always be counted on for a technical solution to just about any financial systems issue. He was also a great organizer who helped with many a golf tournament over the years. He will be greatly missed by all who knew him. So sorry to hear of your loss. I was talking to Mom yesterday and she mentioned that her and Dad had just come from the funeral home. I remember the days many many years ago when we all would go fishing. I remember Steve as a very kind and patient man. This is Harvey and Patricia’s daughter just in case you don’t remember. To the Probert family, so sorry to hear of Steve’s passing. I worked in same building as Steve and he was always so helpful and funny. keeping you all in my thoughts and prayers. My condolences to Steve’s family and friends. I worked with Steve starting in ’98-’01 as a student out of university and appreciated Steve’s great subtle humor. He brought joy to a lot of people and I remember him with a lot of fondness. I just heard about Steve’s passing I’m so sorry for your loss he was a good friend when we were younger keep your memories of him close. So sorry to hear of Steve’s passing. He was a wonderful friend who I thoroughly enjoyed working with for many years. I had a great visit with him at the Miller Centre last month. I’m in Grand Falls celebrating Mom’s 95th birthday with family this week and won’t get to the wake. Will be in touch when I get back.. God bless you and your lovely family. We were so sad to hear of Steve’s passing. Such a wonderful friend for so many years. We will never forget that wonderful sense of humour and all the great times we had. Such a kind pleasant person. Our thoughts are with you Maureen and the whole family. He will be missed by so many. To the Probert family: So sorry to hear of Steve’s passing. Please accept our sincere condolences during this difficult time. Steve will be remembered as a kind gentleman and a great neighbor. I am very saddened to hear about the passing of Steve. I really enjoyed his professionalism as he contributed greatly to the financial side of Service Canada. His quiet but respectful humour was indeed a strong attribute of this real gentleman. My thoughts are with his entire family at this sad time. Jill and Family, So sorry to hear about your Dad. My prayers and thoughts are with you and your family. Maureen and family; I am so sorry for your loss. Hang onto the great memories you have. May he rest in peace. To the Probert Family; We were very sorry to hear of Steve”s passing. I was a co-worker of Steve’s and also got to know him through my sister and her husband on Clearview heights. Our thoughts and prayers are with you at this difficult time. May he rest in peace..
My sincere condolences to the Probert Family during this difficult time. I was was a co-worker of Steve’s for many years. It was always a joy to be around Steve, he was a very nice man who could always get a chuckle out of you. Maureen and family, so very sorry to hear of Steve’s passing. I worked with Steve at Service Canada, Steve always had a joke to share and will be fondly remembered for his humour and wit. My prayers and thoughts are with you all at this difficult time. Maureen and family – so very sorry to hear about uncle Steve’s passing. Out thoughts and prayers are with you at this difficult time. So sad to hear of Steve’s passing. I was a co worker of Steve’s for over 25 years. He was a kind and gentle man who always had a smile and also made you smile. Condolences to the Probert family, he will be dearly missed. I was so sorry to hear of Steve’s passing. I worked with him at Service Canada. He was such a funny guy and always had a smile. He never took things too seriously and I appreciated that about him. I am so sorry for your loss. Maureen, I am so sorry to read of Steve’s passing. My prayers and thoughts are with you and your family. I am so sorry to hear of your dads passing. Your memories will last a lifetime and will make the sad times happy. Thinking of you all. Our condolences to the Probert Family at this difficult time. I worked with Steve for a Number of years at HRDC on Topsail road, not a day passed that he did not make me laugh. I work for systems so I had an opportunity to see Steve daily and have him remind me that I did not know what I was doing lol. thank you Steve for all the years of joy and laughter it was people like you that made me the person I am today . Our sincere condolences on Steve’s passing.. That little smile and twinkle in the eye was typical Steve whenever we met. He was my good friend from the day that we met so many years ago. Maureen and family, I am so sorry to hear of Steve’s passing. He will be missed greatly. He was a great guy to work with and play golf with. I will always remember his sense of humour and our chats running around in the golf cart. My prayers and condolences to the Probert family. Steve was a dear co-worker who was always a gentleman. He always wore a smile and was a very kind person. My husband went to school with Steve and remembers him as a friend to all. I’m so sorry to hear of Steve’s passing. It was such a pleasure to know him and work with him. His humour always made me laugh. Sympathies to the Probert family. He will be dearly missed. So sorry to learn of Steve’s passing. I was a coworker of Steve’s for many years. He was always so helpful and kind. My thoughts and prayers are with you all at this time..
My deepest condolences to the Probert family. Steve was a great friend and coworker. So sorry to learn of Steve’s passing. Unfortunately we did not get a chance to connect in the last couple of “cousins’ reunions. We will remember Steve and his humour as we [the cousins] sat around the table on an “Aunt Mabel” mission. Hold on to your memories. So sorry to hear of Steve’s passing. I first met him through work. He was so easy going and had a great sense of humor. 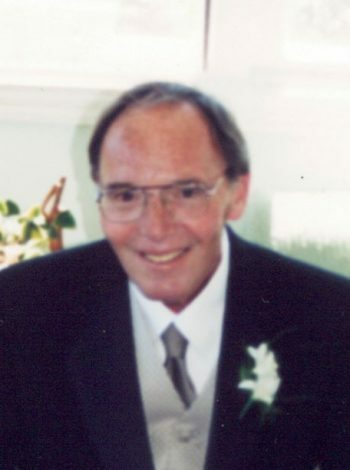 He loved his game golf and was selfless in helping organize the yearly work tournaments at Terra Nova. RIP Steve. So sorry to hear of Steve’s passing. I had the pleasure of working with Steve and he was a wonderful colleague. Sincere condolences to all family members. So sad to lose Steve especially for you the children and his grandchildren. After visiting him at the Miller Centre it was clear his challenge was enormous. We believe that he now has escaped the prison of his illnesses and is resting comfortably until he resumes his work to watch over and guide those who were so precious to him. Our best wishes for you and the family. Very sorry to hear of Steve’s passing. He was a great co worker who always brought out the best in people.. He had a tremendous sense of humour and it was evident that he loved life and his family dearly Thoughts and prayers for all at this time. Sorry to hear of Steve’s passing. May his soul rest in peace and God’s blessings be on you all. Maureen (Moe), Gillian, Andrea, Jennifer, Katie, Greg and your extended families – my thoughts are with you all. Maggie and I express our deepest sympathy to you at this time. Hold on to the memories which Steve gave us during his life time. May he rest in peace – Godspeed Steve. Maureen and family, I am so sad to hear the news on Steve. He was a tremendous guy and always there to help you.. my thoughts and prayers are with you folks and you will have lots of great memories to help you through this difficult time. Unfortunately I am away and will not be able to attend the funeral. Take care. Maureen and family , thoughts and prayers are with you and your families. May God hold you in the palms of His hands and carry you through the dark days ahead.